Dyson handle wand release catch in Light Steel for Dyson DC07 vacuum cleaner models. Genuine Dyso.. Replacement wand handle catch to fit Dyson DC07 vacuum cleaner models. High quality catch whi.. This is a genuine Dyson wand cap spring for your DC04. 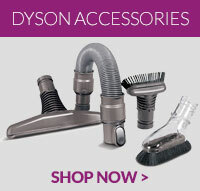 ..
Genuine spare part to fit Dyson DC03, DC04 and DC07 vacuum cleaners .. Compatible replacement yellow wand handle catch for Dyson DC07 vacuum cleaner models. ..
Genuine replacement spare part to fit select models of Dyson vacuum cleaners .. This item is a genuine spare part for select models of Dyson DC19, DC22, DC23 and DC24 vacuum cleane.. This is a genuine part designed to replace the wand cap spring on select Dyson models. Compatible..